Smart Jamba Juice weight loss choices can be tricky. While the drinks sound healthy, many of them can be very high in calories and also high in sugar. So what's the healthiest Jamba Juice smoothie? And is it possible to enjoy a low carb Jamba Juice treat? Use this guide to decode the Jamba Juice menu and keep your diet on track. Some dieters feel that juicing for weight loss is a good idea. Others disagree—including many nutrition experts. Regardless of your preference, you might find yourself in a pinch when you need to order a juice drink or smoothie when you're on the road. There are a few things you should know about Jamba Juice nutrition. First, the calories in juice drinks and smoothies can be very high-no matter where you buy them. For that reason, it's usually a good idea to order the smallest sized drink if you're on a diet or watching your sugar intake. Jamba Juice drinks come in 16, 24, and 32-ounce sizes. But the company also makes 9.5-ounce smoothies geared for children (Jamba Kids) that might satisfy your sweet tooth for fewer calories and grams of sugar. Also, just because the drink contains healthy ingredients, doesn't mean that it is the healthiest choice for you. For example, some juice drinks contain more than a full day's recommended allowance of sugar. Consuming too much sugar can be a problem if you are trying to lose weight or manage a condition like diabetes. You can always check the nutrition facts for your drink on the company's website before you go to make sure you are staying within your nutritional goals with your drink choice. On the upside, however, drinks from Jamba Juice do help you to get important vitamins and minerals from fruits and veggies. According to the company, Jamba Juice smoothies and juices are "formulated to meet or exceed the FDA’s Heart Healthy Nutrient Requirements, just one fresh fruit Smoothie will score you the recommended 5-a-day servings of fruits or vegetables." For example, the Veggie Vitality smoothie (see label) provides 420 percent of your daily recommended intake of vitamin A and 40 percent of your recommended intake of vitamin C. The drink also provides 15 percent of your daily iron needs and 25 percent of your recommended intake of manganese if you consume a 2,000 calorie per day diet. The nutrition experts at Jamba Juice will point out that all sugar is not created equal. Kathleen Zelman, MPH, RD explains the details about the sugar in drinks at Jamba Juice. Kathleen is on the restaurant's Healthy Living Council. "The majority of our beverages and foods are made without added sugar or high fructose corn syrup," she said, "a small percentage of our beverages contain sugar in the form of soy milk, dairy or sherbet." She went on to explain the difference between added sugars and those that occur naturally in fruit. "Dieters should choose hydrating beverages made with whole fruits and veggies for the added benefit of fiber which can slow down absorption, sustain blood sugar, energize and make them feel full. Feeling full helps keep fingers out of the cookie jar and reduces cravings." 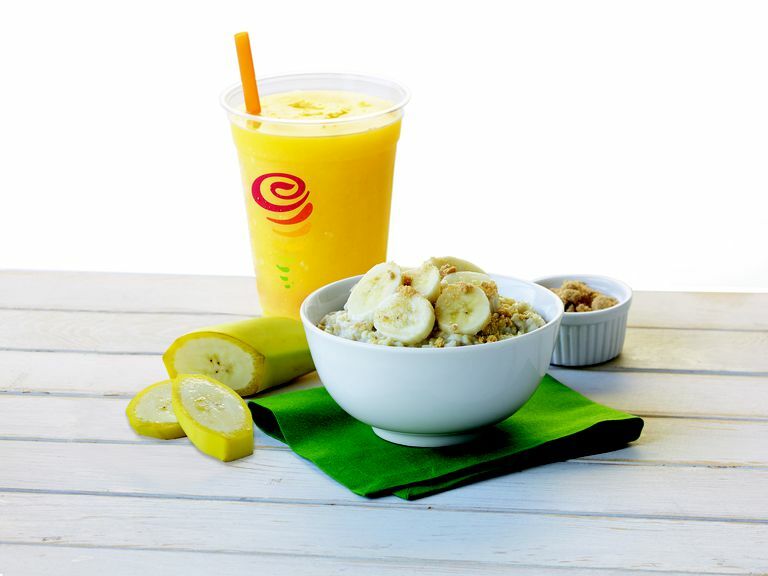 There isn't necessarily one choice that is best for every body at Jamba Juice. The healthiest smoothie depends on your goals. You might want to find a low-carb Jamba Juice treat, or simply one with fewer calories. For example, if your goal is calorie control, the healthiest Jamba Juice is going to be a small drink that is made with both fruits and vegetables to boost nutrition and add flavor. Drinks that contain a healthy source of fiber and fat (like chia seeds) help to boost satiety. Cucumber Orange Cooler (made with orange juice, cucumber juice, apple juice, and lemon juice) contains 130 calories, 0.5 grams fat, 32 grams carbohydrate, 0 grams fiber, 25 grams sugar and 2 grams of protein. Veggie Vitality (made with carrot juice, apple juice, spinach, kale, and chia seeds) contains 130 calories, 1.5 grams fat, 27 grams carbohydrate, 2 grams fiber, 23 grams sugar and 3 grams of protein. Great Greens (made with cucumber juice, apple juice, Ice, spinach, kale, lemon juice, and chia seeds) contains 110 calories, 1.5 grams fat, 24 grams carbohydrate, 2 grams fiber, 17 grams sugar and 3 grams of protein. Apple and Greens Smoothie (made with apple-strawberry juice, kale, bananas, mangos, and peaches) contains 250 calories, 1 gram fat, 60 grams carbohydrate, 4 grams fiber, 45 grams sugar and 4 grams of protein. Other lower calorie smoothies include the Peach Perfection which provides 210 calories and 4 grams of fiber and the Orange Carrot Karma smoothie that provides just 180 calories and 3 grams of fiber. In general, most Jamba Juice smoothies contain 300 calories or more. If your goal is balanced nutrition, the healthiest Jamba Juice smoothie will be one with added protein. The addition of protein will help to balance out the sugar in the drinks. For example, the popular PB and Banana smoothie provides 480 calories, but 32 grams of protein from whey protein powder will balance out the 35 grams of sugar. Also, the Protein Berry Workout provides 290 calories, and 17 grams of protein to balance out the 45 grams of sugar. And keep in mind that smoothies are not the only option at Jamba Juice. If you need to curb hunger cravings consider a food item. The Strawberry Greek Yogurt Bowl (290 calories, 23 g protein and 3 g fiber, 32 g sugar) can be customized to your preference if you prefer to eliminate the honey. Greek yogurt provides protein and the strawberries add sweetness to satisfy cravings. One of the most popular drinks at Jamba Juice is the Peanut Butter Moo'd made with peanut butter, bananas, nonfat vanilla frozen yogurt, and milk chocolate. The small-sized smoothie contains 480 calories, 10 grams of fat, 17 grams of protein and 72 grams of sugar. If you're craving the creamy taste of chocolate consider getting a La Vida Mocha instead. The drink is made with Chocolate Moo'd, along with nonfat frozen yogurt and cold brew coffee. A small-sized drink contains 290 calories 8 grams of protein, but 49 grams of sugar (still high in sugar, but lower than the original drink). Another popular drink is the Orange Dream Machine made with orange juice, nonfat vanilla yogurt soymilk, and orange sherbet. This small drink contains 350 calories, 8 grams of protein, but a whopping 71 grams of sugar. A healthier alternative is the Orange Supreme made with orange juice, carrot juice, bananas, apple juice, and chia seeds. A small size has only 200 calories, 33 grams of sugar and 3 grams of fiber. Can You Go Low-Carb at Jamba Juice? You'll have a hard time finding drinks that are truly low in carbohydrates at Jamba Juice. Since most of the beverages are made with juice and many are made with sherbet, you'll get quite of bit of sugar and carbs in each drink. Turkey Sausage 'n Cheese Breakfast Wrap with 320 calories, 16 grams fat, 17 grams protein, and 29 grams of carbohydrate (28 net carbs). Spinach 'n Cheese Breakfast Wrap with 240 calories, 8 grams of fat, 15 grams of protein, and 30 grams of carbohydrate (27 net carbs). Turkey Sausage, Roasted Red Pepper & Gouda breakfast sandwich with 290 calories, 12 grams of fat, 20 grams of protein, and 25 grams of carbohydrate (24 net carbs). Remember that the Jamba Juice menu items you choose should be part of a comprehensive plan for weight loss. You need plenty of nutrients to stay energized throughout the day, but you also need to create the right calorie deficit to lose weight. Smart dieters can find what they need on at Jamba Juice if they pay attention to good nutrition and control portion sizes.